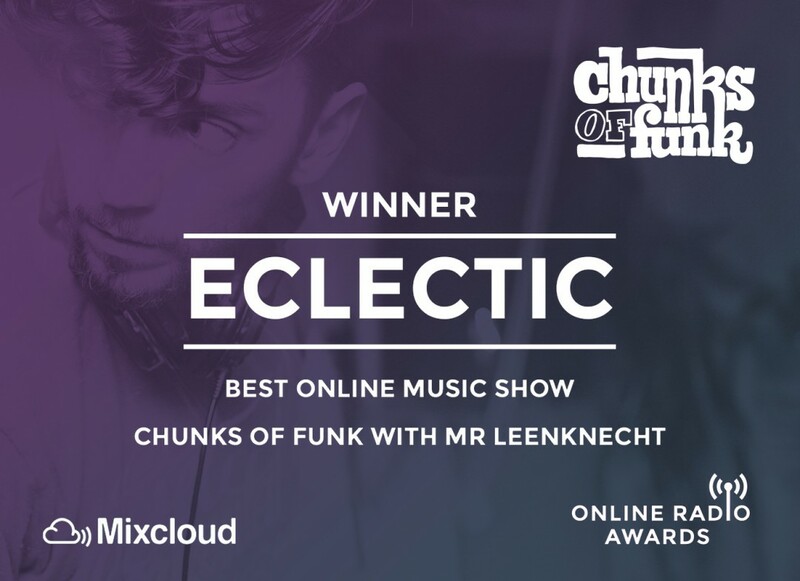 Chunks of Funk gets ‘Best Online Music Show’ nod in the Eclectic category at the annual Online Radio Awards. I was really surprised to be nominated alongside Bradley Zero’s Rhythm Section (NTS, London), Tim Sweeney’s Beats in Space (WNYU, New York), Darker Than Wax (The Lot Radio, New York / Singapore) and Throwing Shade (NTS, London). These are shows that I respect a great deal, shows that have serious global reputations. I was humbled to share the shortlist with them, and I didn’t think this would go beyond that, but the jury sprung another surprise on me. My show has barely been on the air for a year and is broadcasted in four different countries. Through Mixcloud, music lovers from around the world, tune into Chunks of Funk. It’s a pleasure to share the work of amazing musicians with a wide-ranging and broad-minded audience. My selection is eclectic: from beats to bossa, hip-hop to house, with my partner Pascoe providing some colour and detail between selections. Check out my video stream that was part of Online Radio Awards Day (15 December 2016), a unique Facebook Live broadcast hosted by Mixcloud, lasting 24 hours and featuring radio shows from around the world. Special thanks goes out to Pascoe Sabido, to my supportive and patient wife Liz Aku, to all the musicians who create the great and funky music I play, to all the radio stations broadcasting my weekly shows: Bruzz, Reform Radio, Ness Radio, Neringa FM, to the Mixcloud team for their amazing music platform and of course to all the listeners and music lovers worldwide. Keep on listening, liking, reposting, commenting and so on. Much Love!! Find out more about The Online Radio Awards and if you don't follow me on Mixcloud yet, head over to my page and click … follow.